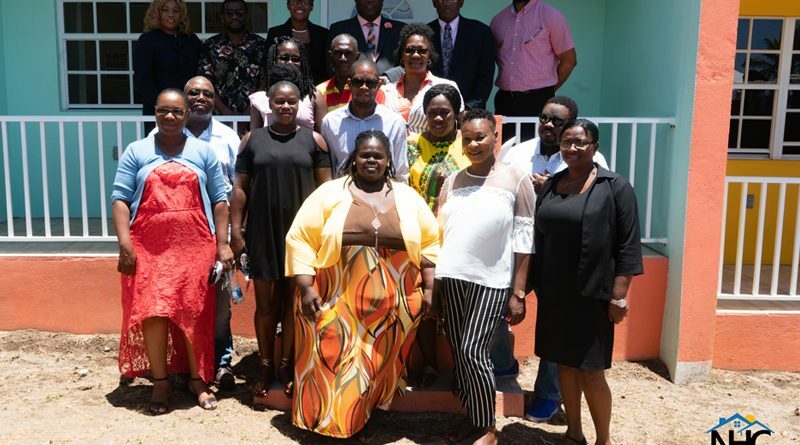 BASSETERRE, St. Kitts – THE lives of twelve additional families have been improved thanks to the Team Unity Government and the National Housing Corporation (NHC) staying true to their word of providing strong, spacious and affordable homes to the people of St. Kitts and Nevis. In a handing over ceremony held today (Aug. 23) at La Guerite, twelve families received the keys to their brand-new homes. Some built-in clusters while the others were constructed on pre-owned lots. Speaking at the handing over ceremony, NHC’s General Manager, Elreter Simpson-Browne announced that of the 21 years that the NHC has been in existence, the Unity Housing Solution has been, by far, the best product delivered to the people of St. Kitts. She stated that NHC and Team Unity is not finished with Constituency Number Three as yet because apart from the 12 homes delivered, there were an additional eight houses being constructed on individual lots throughout the Constituency and a contract is about to be signed to construct another townhouse. “Our intention is to make an impact on the lives of the residents and citizens throughout the Constituency by ensuring that every area, from The Village to Trinity, benefits,” she said. Simpson-Browne encouraged the new owners to make the houses a home with intangible value and reminded them to honour their financial responsibility so as to make way for those who are still waiting for their home ownership opportunity. “To you the homeowners, we have provided you with a house. It is up to you to turn it into a home and not only a home but, a home of love, of respect and appreciation because I am convinced that with these three ingredients your financial obligations will be fulfilled so that the dreams of the other numerous applicants who have been waiting could be realised,” she explained. Wayland Vaughan, Director of NHC, also urged the homeowners to honour their financial obligation by making their mortgage payments. He further urged them to maintain their new homes by making adjustment, upgrades, and upkeep necessary to ensure longevity. “If you don’t maintain the house, its value will depreciate and in doing so, all that you would have been investing in can go down the drain in time…We want to encourage you to maintain your property, be vigilant,” he said. Minister of Human Settlement et al, Hon. Eugene Hamilton, in congratulating the new homeowners, encouraged them to take time to beautify their houses. He urged them to go the extra mile to ensure their homes are kept secured. One such security measure, he pointed out, was to fence the yards. Hamilton further urged the recipients to plant a garden, adding that such an action will reduce the food costs. Senator Akila Byron-Nisbett, Caretaker for Constituency Number Three shared in the excitement with the new homeowners, stating that they have now been empowered. “As Caretaker for Constituency Number Three, I am always excited and most delighted when we can share in the accomplishments and the achievements of the people within this constituency…and we all should feel just as excited and happy to see that persons we know, persons from our communities, our villages, neighbours, persons that we grew up with, persons who we knew since they were children now have that opportunity to own their own home. They have been empowered,” she said. Prime Minister Dr. Hon. Timothy S. Harris also congratulated the families on their upgrade to home ownership, adding that St. Kitts and Nevis has the lowest interest rate on mortgage which is a mere two percent. He said that the young people of St. Kitts are also being empowered because the Team Unity Government is also ensuring that they are receiving their own homes as well, noting that in previous years that was not possible. “It is the difference in our philosophy. It is the fact that we put people first. It is the fact that the results of our work that are here why you could have confidence in our government to do the good deed. So we come here today in West Basseterre doing the good deed, reducing the divide between those who have homes and those who do not and pledging that we will ensure that persons in St. Kitts and Nevis, among all countries of the world, will have the best homeownership rate in the country,” the Prime Minister stated. Team Unity Government and NHC will continue their effort of empowering the people of St. Kitts through affordable home ownership with key distribution ceremonies throughout the remaining constituencies within the upcoming weeks.